Less than two months after Facebook made its decision to open a sales and operations office in Austin, Texas official, the company is on the move again. 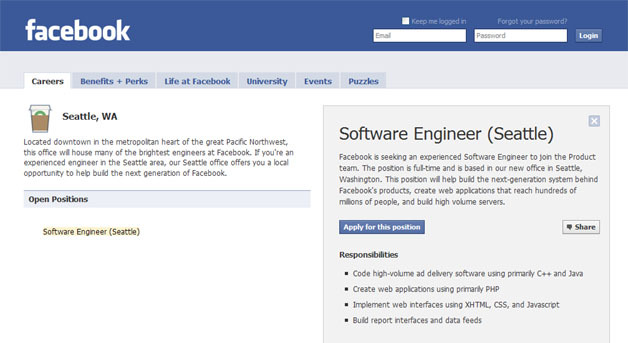 Facebook's announced that it next intends to open a small engineering office in Seattle, Washington. This will perhaps not be a huge deal; Seattle Mayor Mike McGinn said in a statement that Facebook's only looking for an office that will accommodate 30 or so employees. On the other hand, any expansion out of Palo Alto is a sort of new and exciting thing at this point in the company's history.